Where Are The Apennine Mountains? The Apennine Mountains are located on the Italian Peninsula. The Apennine Mountains in Italy. The Apennine Mountains are a mountain range which consists of smaller parallel chains extending approximately 750 miles along peninsular Italy. Sometimes referred to simply as the Apennines, the chain of mountains join the Ligurian Alps at Altare in the northwest, and end in the southwest at Reggio di Calabria. The Apennine Mountains tend to be named from the provinces in which they are situated. For instance, the Ligurian Apennines are named after the Liguria region. 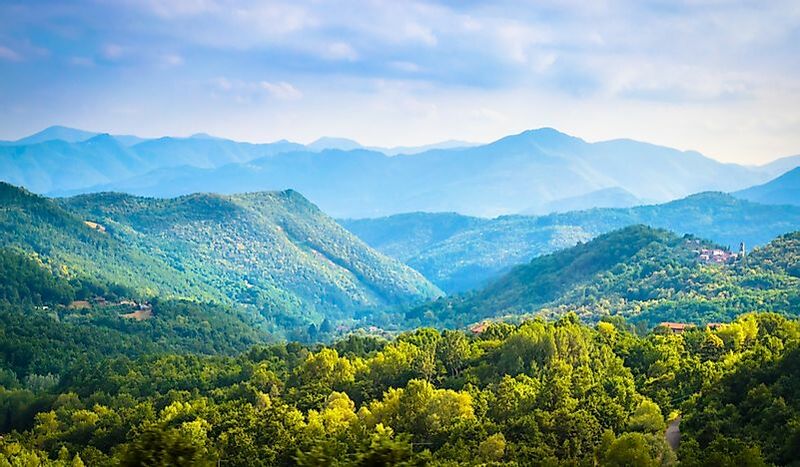 The range also lends its name to the Apennine peninsula, which extends for about 620 miles from Po Valley to the Mediterranean Sea, and forms a major part of Italy. The Apennine Mountains are sub-divided into three main sectors: the Northern Apennines, Central Apennines, and Southern Apennines. The Northern Apennines are further divided into three sub-chains: Ligurian Apennines, Tuscan-Emilian Apennines, and Umbrian Apennines. The Ligurian Apennines are bordered by the Ligurian Sea in the Gulf of Genoa, and the gulf separates the mountains from the upper Po Valley. Its northwestern border runs along the Bormida River to Acqui Terme. The highest point in the Ligurian Apennines is Monte Maggiorasca, which has an elevation of 5,840 ft. The Tuscan-Emilian Apennines start at Cisa Pass and extend southeast, crossing the peninsula along the border between Tuscany and the Emilia-Romagna region. The highest point of the Tuscan-Emilia Apennines is Monte Simone, which has an elevation of 7,103 ft. The Central Apennines are sub-divided into the Abruzzi Apennines and Umbrian-Marchean Apennines, located in the south and north, respectively. The western border of the Umbrian-Marchean Apennines traverses Cagli, extending south to the Tronto River. The highest peak in the Umbrian-Marchean Apennines is Monte Vettore, which has an elevation of 8,130 ft and is also part of Monti Sibillini. The Abruzzi Apennines are located in southeastern Lazio, Abruzzo, and Molise, and contain some of the highest peaks in the Apennines. The chain runs in a northwest to southeast direction, from the Tronto River to Sangro. The eastern chain of the Abruzzi Apennines consists of the southern portion of Monti della Laga, Monti Sibillini, Majella Massif, and Gran Sasso d’Italia Massif. The highest peak in the Abruzzi Apennines, as well as the entire Italian Apennines, is Corno Grande, which has an elevation of 9,554 ft. The Southern Apennines are divided into four major regions: Campanian Apennines, Samnite Apennines, Calabrian Apennines, and Lucan Apennines. The subranges are broken down into smaller groups south of the Sangro valley, which includes the Matese. The Daunian Mountains and Cilento hills connect with the Southern Apennines in the west. The first range of the Lucan Apennines terminates in the north, at the Valley of Ofanto, while its second range runs as far north as the plain of Sibari. The Apennine Mountains contain numerous peaks of varying heights and physical characteristics. At least 21 peaks in the range have elevations greater than 6,200 ft. Most of the highest peaks are located in the Central Apennines, particularly the Abruzzi Apennines. Four peaks exceed 8,100 ft, including Corno Grande (9,554 ft), which is the highest peak of the Italian Apennines, Monte Amaro (9,163 ft), Monte Velino (8,156 ft), and Monte Vettore (8,123 ft). Other notable peaks are Pizzo de Sevo (7,936 ft), Serra Dolcedorme (7,438 ft), Monte Meta (7,352 ft), and Monte Terminillo (7,274 ft). Where Do The Rocky Mountains Start And End?